BUYSOUNDTRAX Records proudly presents THE MIKLÓS RÓZSA COLLECTION: MUSIC FOR GUITAR. The album features music composed for motion pictures by Miklós Rózsa, arranged for guitar by Gregg Nestor, performed by Gregg Nestor, Raymond Burley and William Kanengiser, augmented by Francisco Castillo on Oboe and Carole Kleister-Castillo on Violin. Born in Budapest, Hungary in 1907, composer Miklós Rózsa studied the violin from the age of 5. While living in London in 1935, Rózsa was hired by legendary producer Alexander Korda to score his film, KNIGHT WITHOUT ARMOR. Later, while composing the music for another Korda production, THE THIEF OF BAGDAD, Rózsa moved to California, where he remained for the rest of his life. Throughout his film career, he worked in many genres but distinguished himself writing music for the film noirs of the 1940’s and the great costume epics of the 1950’s and 1960’s. A classically trained composer, Rózsa was well known for his dedication to researching the musical history of the time periods of the films he worked on. His filmography includes music composed for films such as THE THIEF OF BAGDAD, THE JUNGLE BOOK, DOUBLE INDEMNITY, SPELLBOUND, THE LOST WEEKEND, QUO VADIS, IVANHOE, JULIUS CAESAR, KNIGHTS OF THE ROUND TABLE, BEN-HUR, KING OF KINGS, EL CID, THE PRIVATE LIFE OF SHERLOCK HOLMES, THE GOLDEN VOYAGE OF SINBAD and TIME AFTER TIME, among others. For THE MIKLÓS RÓZSA COLLECTION: MUSIC FOR GUITAR, Gregg was allowed access to the composer’s personal archives. The results are arrangements as concise and accurate as possible to the composer’s original intentions. BUYSOUNDTRAX Records is proud to present THE MIKLÓS RÓZSA COLLECTION: MUSIC FOR GUITAR, featuring music composed by Miklós Rózsa. 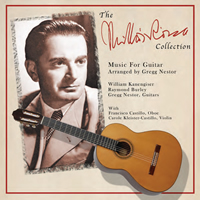 THE MIKLÓS RÓZSA COLLECTION: MUSIC FOR GUITAR is a limited edition release of 1000 units.